This beautiful poker spinner says it all. 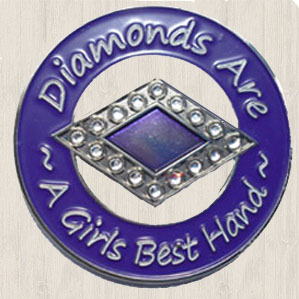 Diamonds are indeed a girl's best hand, especially when held by a skilled player like yourself. The spinner is 45 mm in diameter with 12 Czech diamond colored stones. The spinner includes an acrylic case for safe traveling. It is the most regal of purple colors, letting everyone know just how much taste you have. This is a brand new item, get yours now before they are completely sold out.